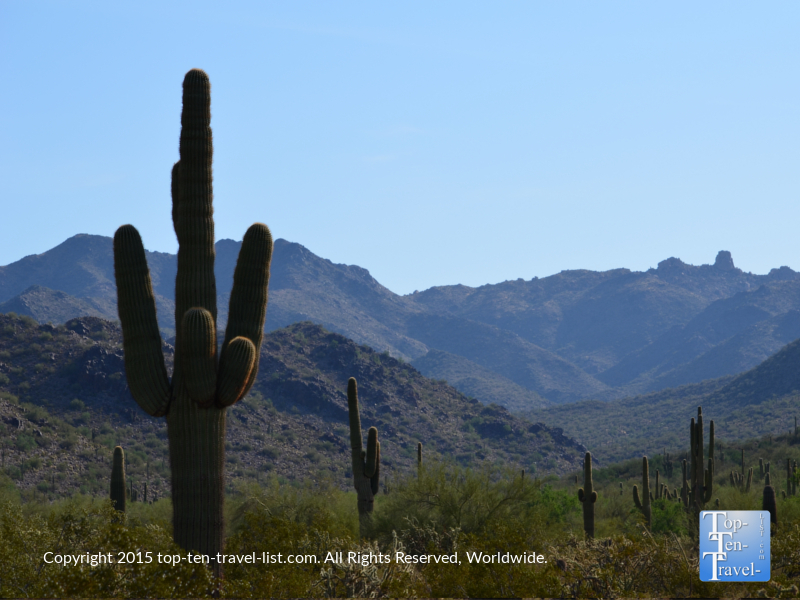 8 Great Daytrips to Escape the Phoenix Heat - Top Ten Travel Blog | Our experiences traveling throughout the US. While the Phoenix metro area is home to a number of unique attractions and offers much in the way of outdoor recreation, the area as a whole is a bit limited in comparison to other similar sized metro areas. Add in 5-6 months of extreme heat and your options become even more limited. Besides a few gems like the Musical Instrument Museum and Scottsdale’s Museum of the West, Phoenix lacks the diversity of world class indoor attractions you find in other major cities. Sure, you will find plenty of shopping malls, endless theaters, endless strip malls filled with common chains, and entertainment centers like Dave & Busters, Topgolf, and Escape Room, however, these can be found in almost every major city. Phoenix is more of a place you visit for the unique desert scenery not found anywhere else in the world. Unfortunately, exploring the majestic Sonoran Desert, which is by far the best thing to do in Phoenix, is basically impossible the entire summer season due to heat exhaustion, as well as dehydration concerns. Extremely low humidity, 110+ degree temps for months on end, and relentless sunshine really are not the best conditions for any type of outdoor activity. Therefore you have 2 options: stay inside all day or set your alarm super early to get out on the trails before the real heat starts. There are numerous gorgeous places to hike in the Phoenix, including my favorite – the Scottsdale McDowell Preserve. Unfortunately, you have to get out there by 5-6am if you want to avoid 110+ degree temps! If you want to be active in the summer as opposed to spending your days cooped up in the air conditioning, a daytrip becomes a necessity. While San Diego & L.A. are typically the roadtrips of choice, these trips are time consuming and expensive, especially during the summer season when everyone else is trying to flee the heat too. Taking advantage of more affordable summer rates at resorts is always an option, although it really is too hot to do much else besides lie in the pool all day. Fortunately, there are many interesting daytrips within a day’s drive, all of which offer a break from the brutal heat. Below are 8 fantastic daytrips within a 4 hour drive of the metro area. 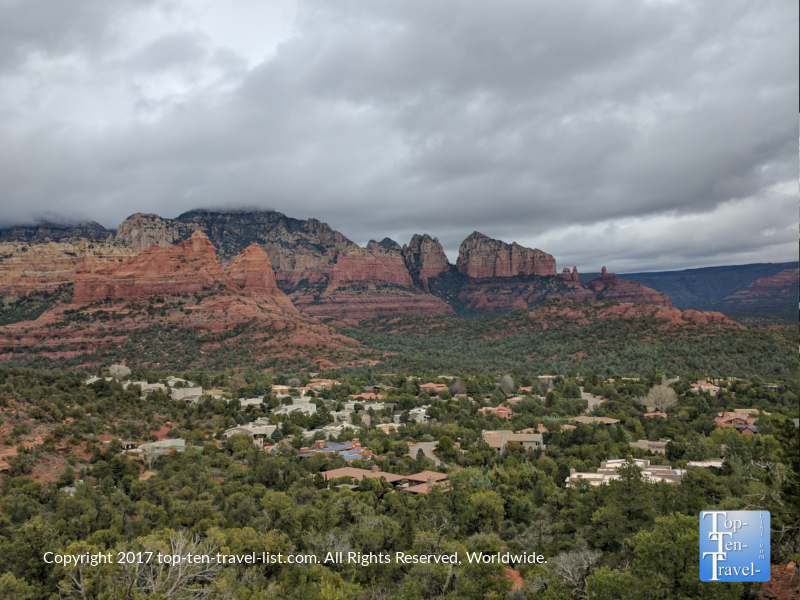 Sedona, a growing tourist hotspot just 2 hours north of Phoenix, is home to mesmerizing red rock sandstone formations, and is easily one of the most beautiful places in the entire country. 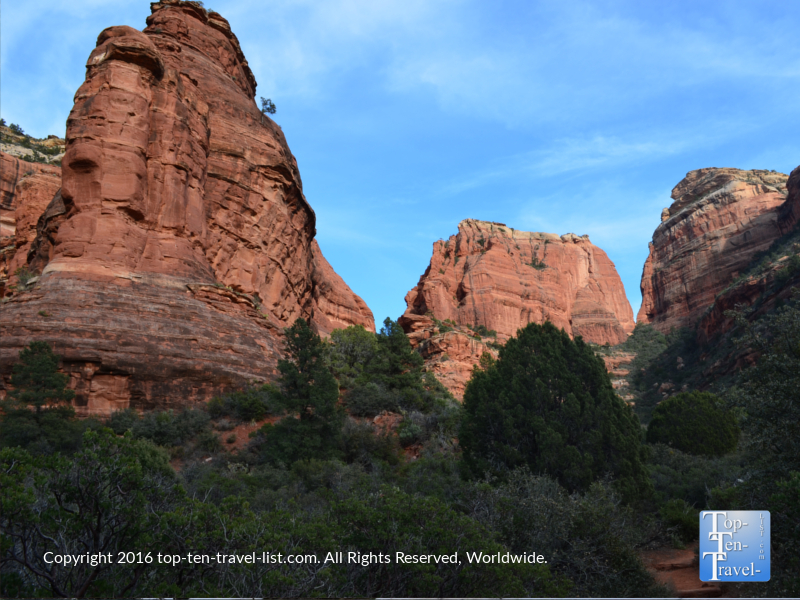 If you only have time for one daytrip from Phoenix, Sedona is definitely the way to go for the immense beauty alone. 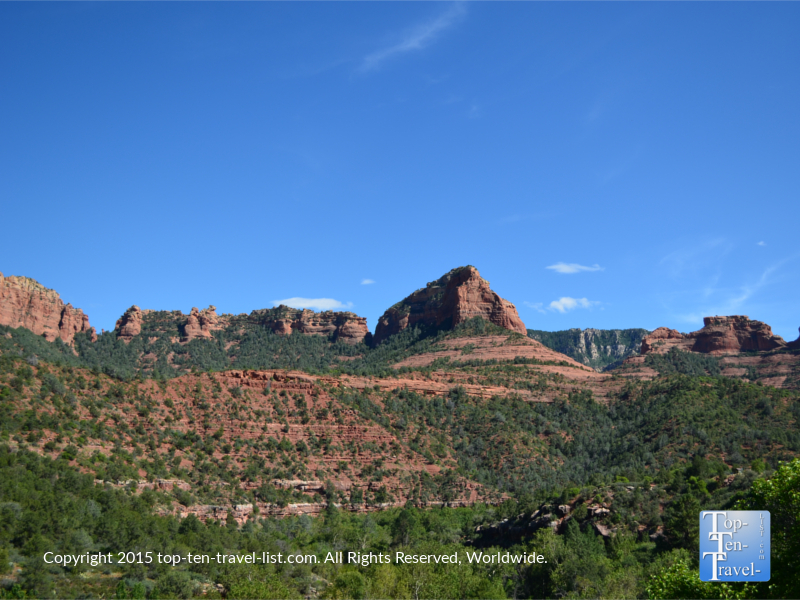 I would even venture to say that if you have to choose between Sedona and Grand Canyon, Sedona definitely wins for the world class red rock scenery, amazing diversity of hikes, and picturesque drives which rival the most scenic in the country. 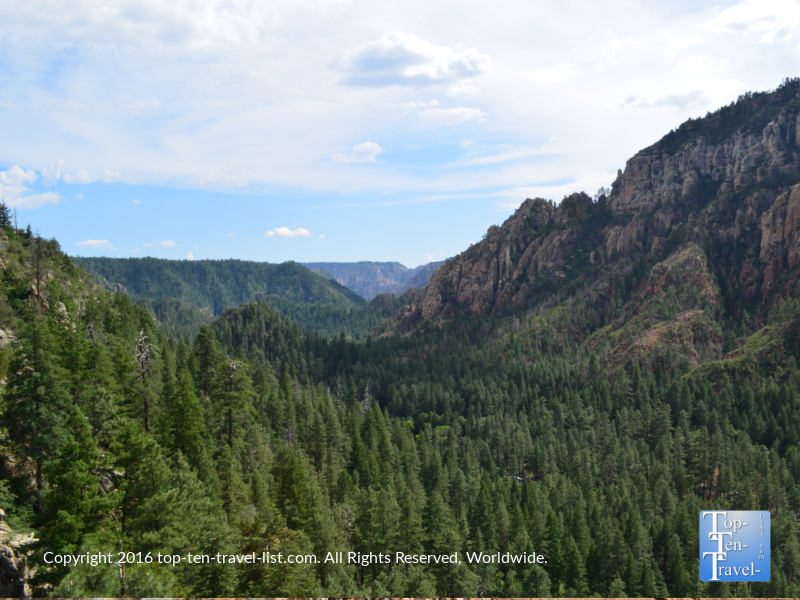 Many Sedona trails are shady, particularly West Fork along the Oak Creek drive and Fay Canyon, one of Sedona’s easiest, yet most scenic hikes. A look at one of 13 fun creek crossings along the beautiful West Fork trail -an excellent hike if escaping the Phoenix heat due to the cool temps and hefty tree coverage! The beautiful Fay Canyon trail is short, shady, and loaded with amazing red rock views. Because the altitude is a bit higher (4300 ft), the temps are slightly cooler in the summer, on average only reaching the mid-upper 90’s or so and much cooler in the morning (60’s & 70’s are the norm). While this may still seem pretty hot, compared to 115+, it feels drastically cooler. 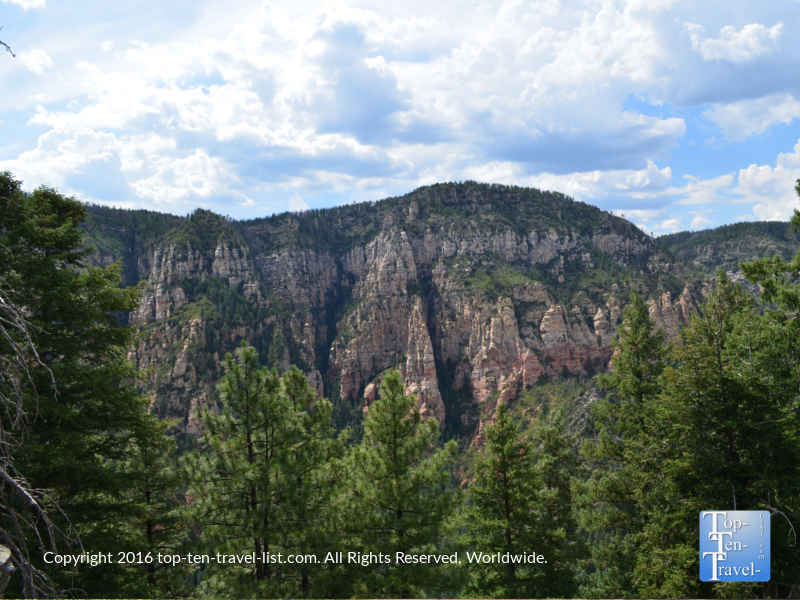 Take a drive along Oak Creek Canyon where the elevation slowly climbs 3000 feet over the course of 14 miles. It’s much cooler in the canyon, and more importantly, very shady with all the leafy trees. 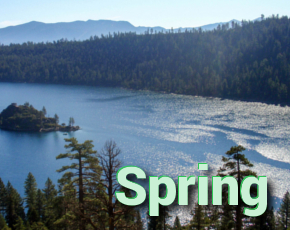 Near the end of the drive, near Flagstaff, the altitude climbs up to 7000 feet, the temp drops even more, and the landscape transforms into lush pine covered forests. 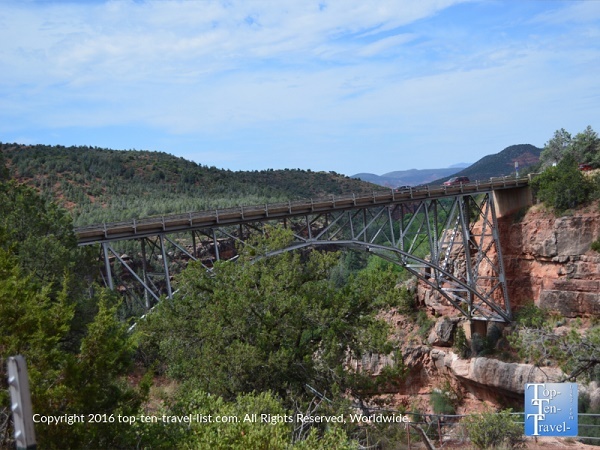 Midgley Bridge – a very popular photo stop and hiking area near the Sedona end of Oak Creek Canyon drive. Sedona is home to hundreds of miles of jaw dropping hiking trails, many of which are short & shady, and thus, perfect for summer. 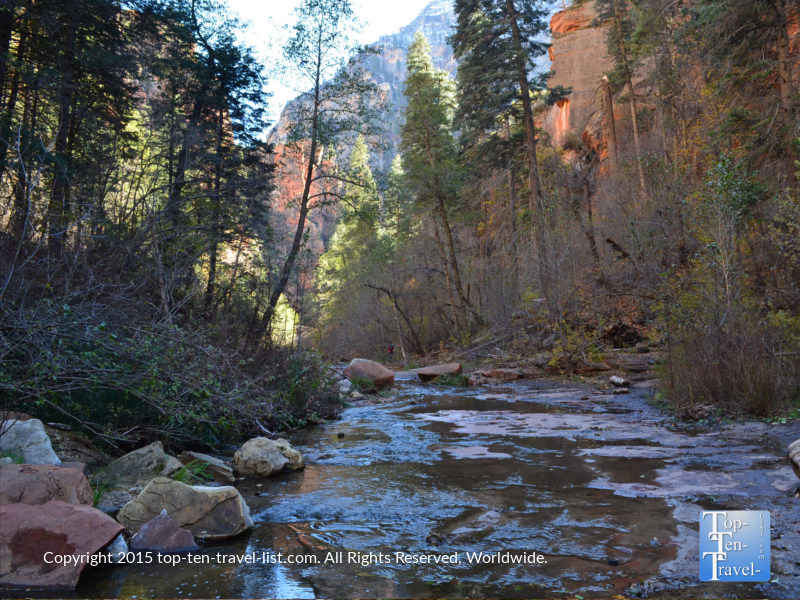 Here are 5 of my favorite easy Sedona trails to get you started. While more moderate in intensity, the stunning Devil’s Bridge hike is amongst the most spectacular in the state. If you are reasonably in shape you will want to put this one near the top of your list. A stroll of about 2 miles leads you to the largest sandstone arch in Sedona where you will have some pretty great photo opportunities. 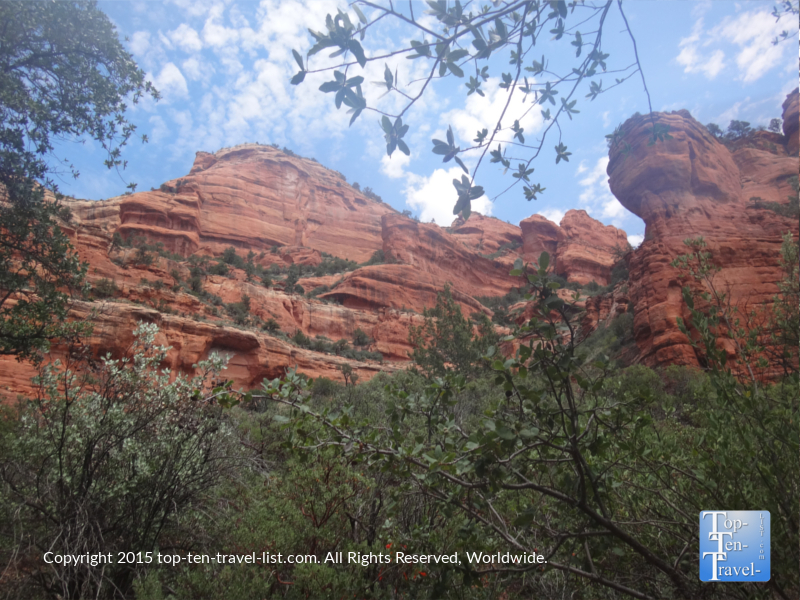 The Teacup trail is one of my favorite easy trails in Sedona. 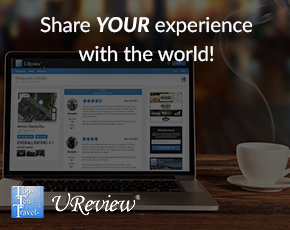 It’s short, relatively flat, close to town, & has the most amazing red rock views! 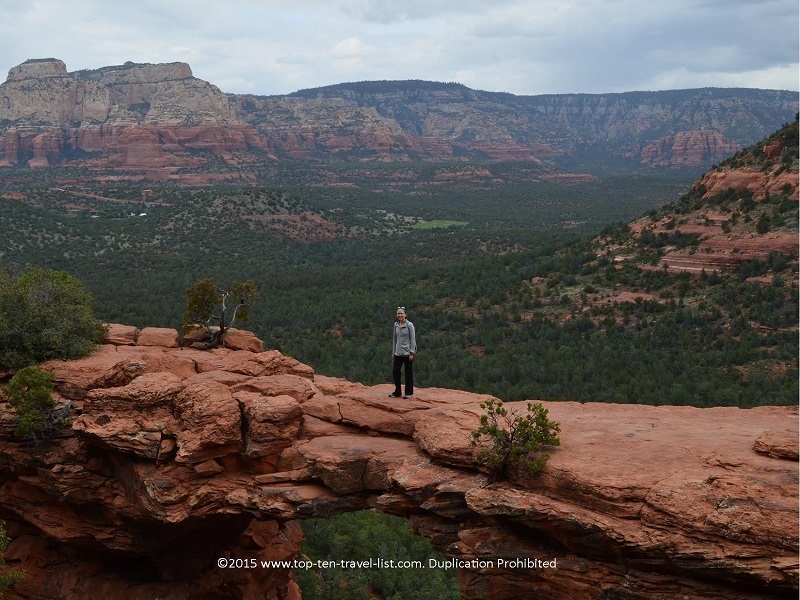 Walking across Devil’s Bridge – one of the best experiences you will have in Sedona! Don’t worry if you are not a hiker – there are many ways to take in the breathtaking scenery including scenic drives (check out Oak Creek as well as the Red Rock Scenic Byway), swimming holes (check out Slide Rock State Park’s natural sandstone waterslides), trolley tours, and a fun little shopping/dining area known as Uptown Sedona where you can find all sorts of Southwestern restaurants, galleries, and specialty shops, all while enjoying some fabulous red rock scenery in the background. Jeep tours are overpriced & overrated in my opinion, although the trolley ride is a good alternative for those not interested in hiking. One of many interesting rock formations you will see along the incredibly scenic Red Rock Scenic Byway. 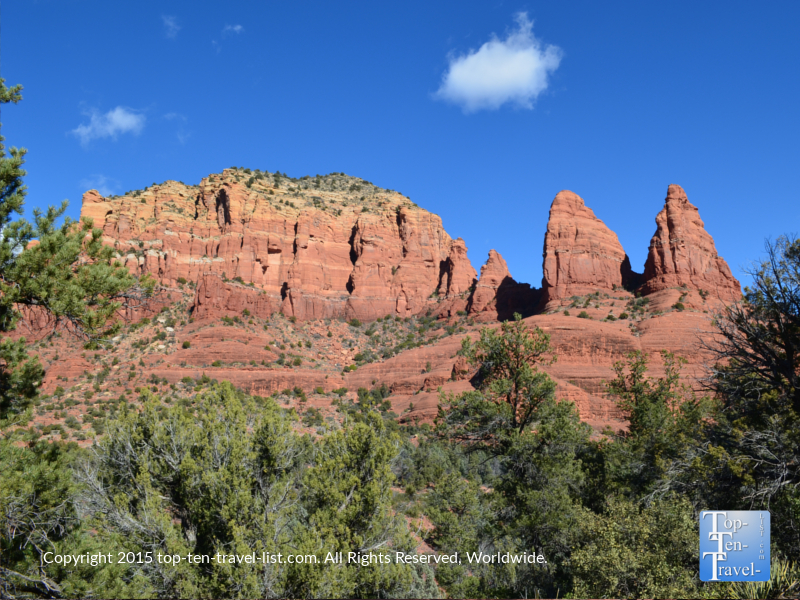 All of Sedona’s rock formations are named after the shape they resemble. This one is known as the 2 Nuns and Madonna and Child formation – see if you can make out the shape? 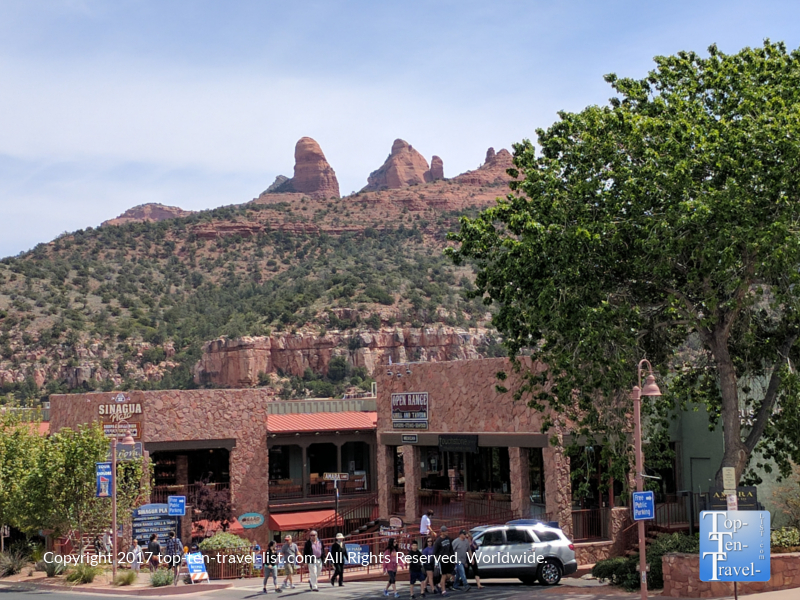 Uptown Sedona – a lively area with boutique shops, restaurants, art galleries, and most importantly, amazing red rock view! 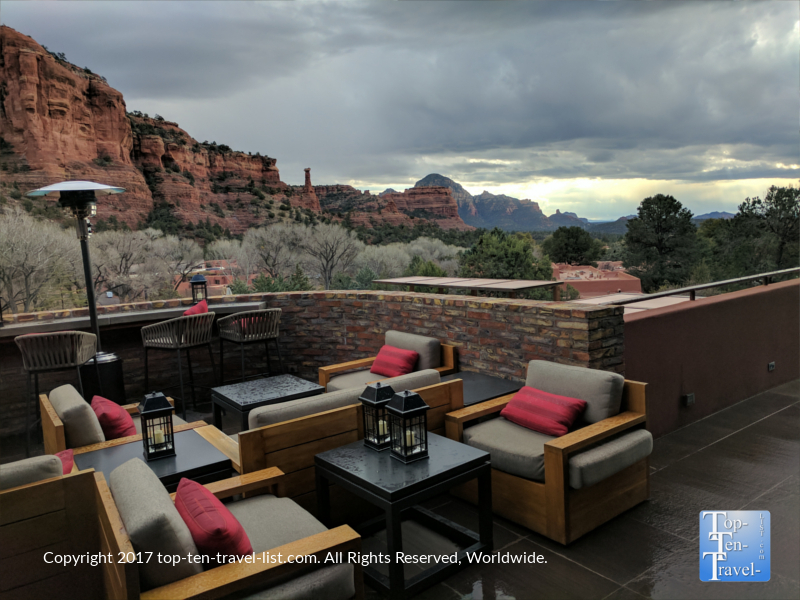 For more great views, simply head over to any Sedona restaurant -most of which have shady patios facing the red rocks. 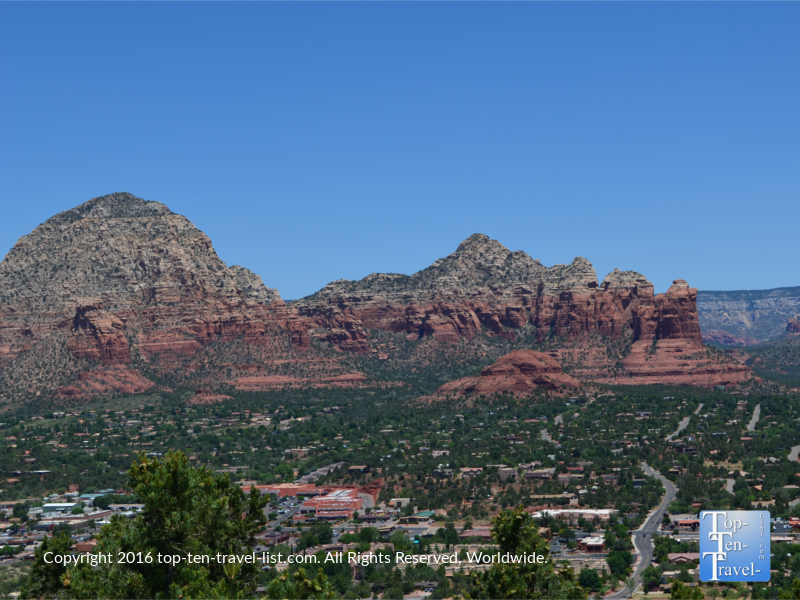 Check out my list of the top restaurants in Sedona. 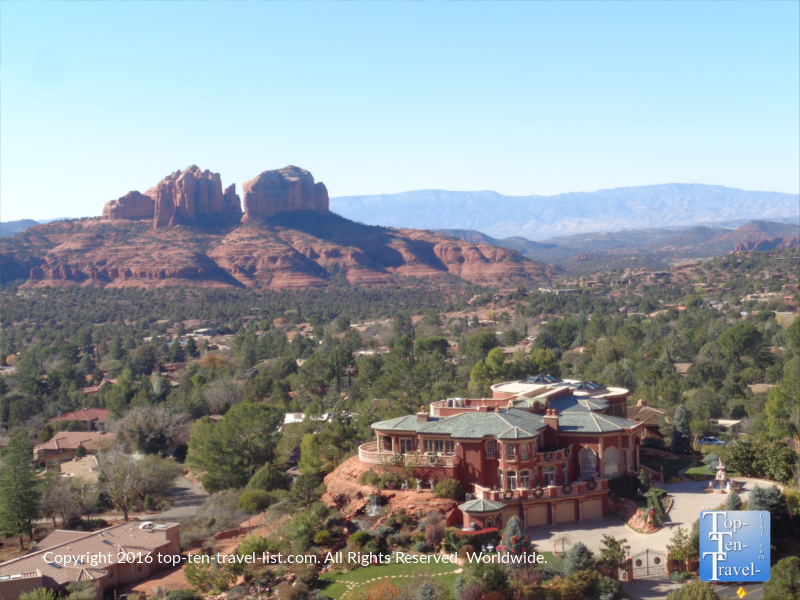 Che-Ah-Chi at the Enchantment Resort – the most scenic restaurant in Sedona! You will also want to make time for a visit to the Chapel of the Holy Cross, a gorgeous Roman Catholic church designed by a student of Frank Lloyd Wright. 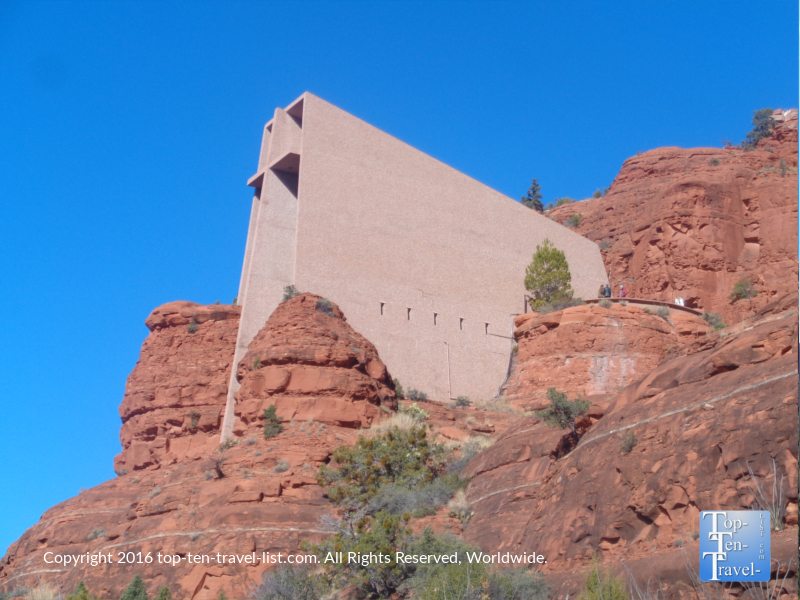 This church really is unique as it was built between 2 rock formations – the overlook here is home to perhaps the most jaw dropping views of all. It’s no surprise that this was rated as one of the top 7 man made wonders in Arizona. In a state with many wonders, this says a lot. The chapel is a mesmerizing sight – both inside and outside! The architecture is amazing, and the views are breathtaking! The views from the Chapel. On a side note, that gigantic house is owned by the founders of LASIK eye surgery! Sedona is also well-known for its’ strong New Age community, so there’s lot to do in the way of New age shops, psychic readings, spiritual healing, aura reading, etc. – if that’s your thing. 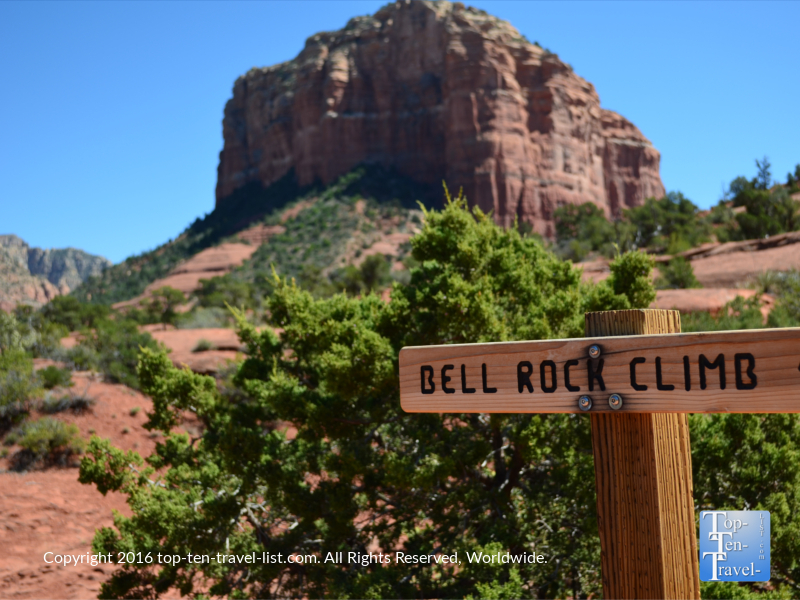 If you are into mystery & the supernatural, a night tour of Bell Rock – rumored to be a UFO sighting hotspot – is an interesting evening activity. You will also want to check out one of Sedona’s vortex sites. Vortex sites are believed to be areas of intense natural positive energy where visitors claim to feel rejuvenated or healed of various ailments. The whole Sedona area is considered to be an energy vortex, with some sites stronger than others, particularly Boynton Canyon (my personal favorite), Airport Mesa, Cathedral Rock, & Bell Rock. Scenery wise, Boynton is the most diverse of the vortex hikes. Wide open vistas of the red rocks, to tall pines, to lush desert plant life, even some snow in the spring and winter months – you will find just about everything here. The Airport Mesa loop is probably the most scenic of the 4 vortex hikes. The trail is long but pretty easy so pretty much doable by anyone in decent shape. Note: those afraid of heights should definitely skip this one due to the steep drop offs! Cathedral Rock – a favorite hike of both locals and tourists is said to be the most powerful vortex. The hike to the top is challenging and a bit scary. If afraid of heights, opt for the Templeton Trail (starts at the same place) and enjoy great views of Cathedral Rock. 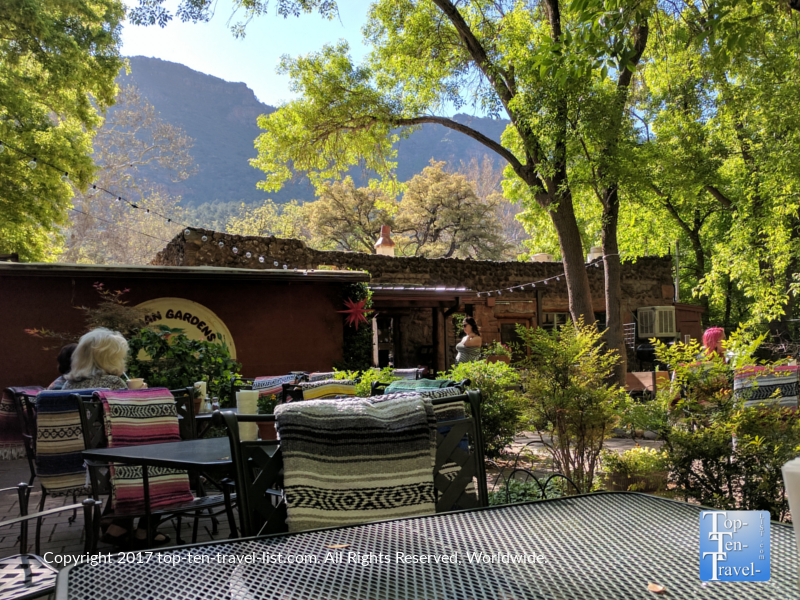 The best place to eat in Sedona, be it for breakfast or lunch, is Indian Gardens located on the scenic Oak Creek Canyon drive. 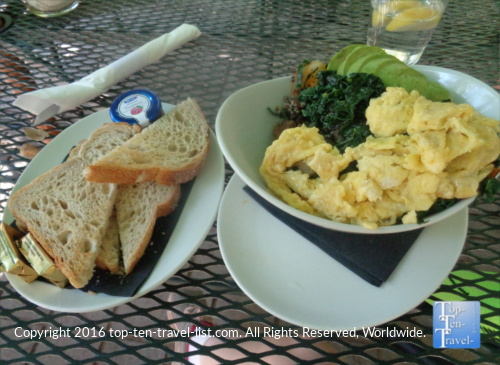 They have a gorgeous shady patio with lots of leafy trees, plus delicious food and the best coffee in Arizona. The focus on using non-GMO local ingredients is also a plus. The breakfast burrito and Grains and Greens bowl are 2 excellent choices. I highly recommend picking up a loaf of their amazing homemade sourdough bread. They also offer lots of healthy salads and sandwiches to bring along for a picnic or hike. The drive over here is beautiful enough in and of itself to warrant a visit. The coffee and espresso based drinks at Indian Gardens are the best in the area. 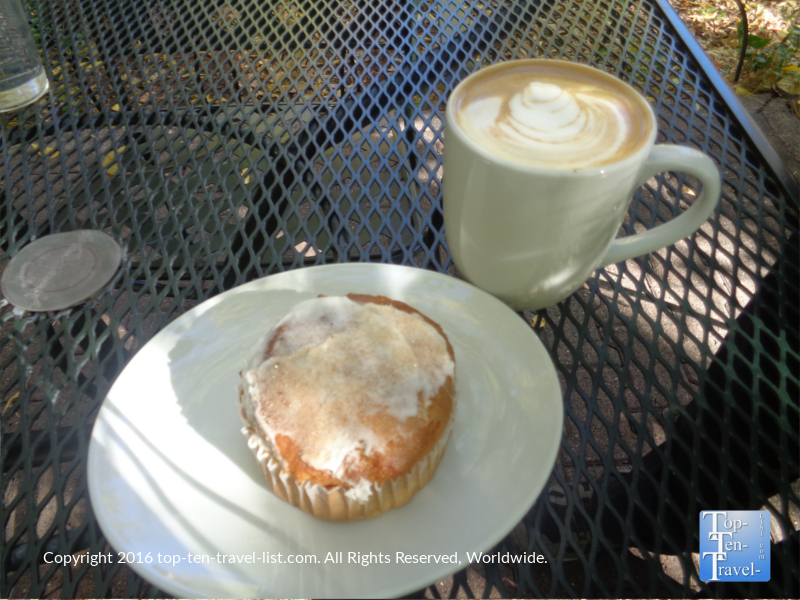 Do try the Pumpkin muffin if available – Indian Gardens offers an amazing selection of homemade pastries daily. Everything on the breakfast menu at Indian Gardens is terrific especially the Grains and Greens bowl which consists of 2 eggs your way mixed with butternut squash, quinoa, kale, topped with avocado and served with sourdough toast. I order this every time I visit! 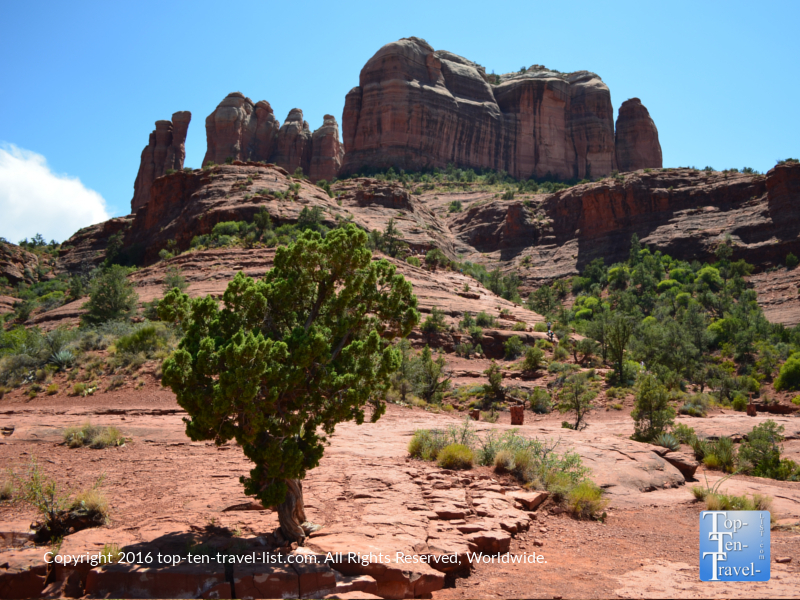 Overall, Sedona is the perfect daytrip destination for hikers, photographers, nature lovers, and anyone else seeking a beautiful place to escape the Phoenix heat. 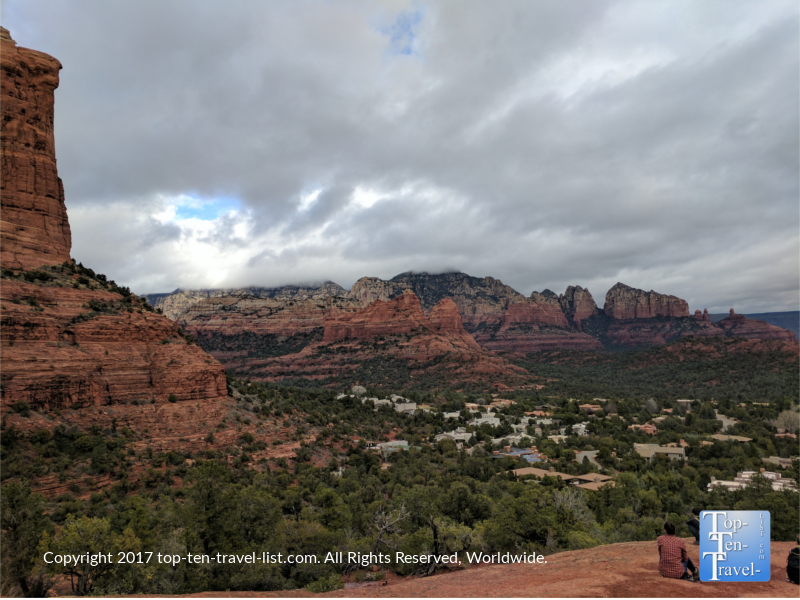 As a resident for several years, I have basically seen it all, and therefore, have compiled a list of the best-of-the-best Sedona has to offer – check out my list of 29 must-do’s in Sedona.